The secret to customer engagement on Amazon isn't complicated: Brands that want to create a positive customer experience need to focus on creating great product page content. 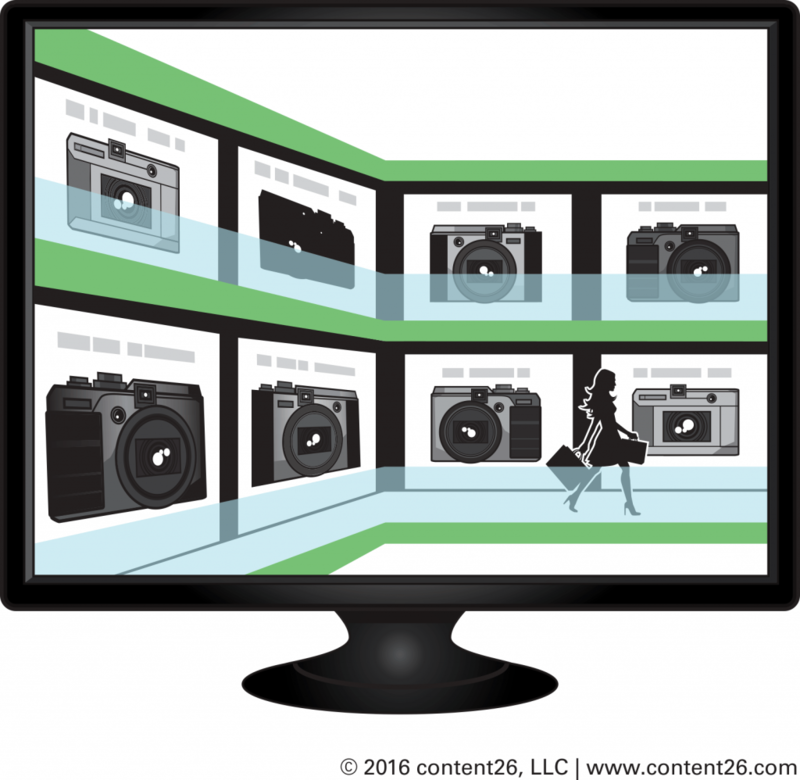 When potential customers come to a product page and find information and imagery that lets them fully grasp the item on the digital shelf, they are much more likely to buy. If a product page is lacking the information the customer is looking for, they're going to take their sale elsewhere. Another reason content is so vital to your brand can be summarized with one word: Discoverablity. Your product needs to stand out the other tens or even hundreds of thousands of competing products that Amazon sells. Your content is indexed by Amazon’s search engine, and it is the source of information no matter what platform consumers use to access it: desktop, mobile, and voice. No matter what new technology comes into play with how consumer find and buy your products, content in all its forms will continue to be vital. No matter what changes Amazon makes, if brands invest in content that creates a good customer experience, they will likely continue to be in synch with Amazon’s “customer-first” vision of the product page. Here are two examples of brands that are taking innovative approaches to content and discoverability. In early 2018, Amazon began offering "Premium A+" content to certain brands. Premium A+ includes high-definition imagery, embedded rich media, and interactive modules intended to make the product page experience more modern and immersive. These premium modules come with a premium price tag, so they need to be utilized for the right type of product to be properly effective. Samsung has been an early adopter of Premium A+ content with excellent results. The company has doubled down on their content strategy, understanding that informed customers are more likely to purchase big-ticket items like HDTVs. 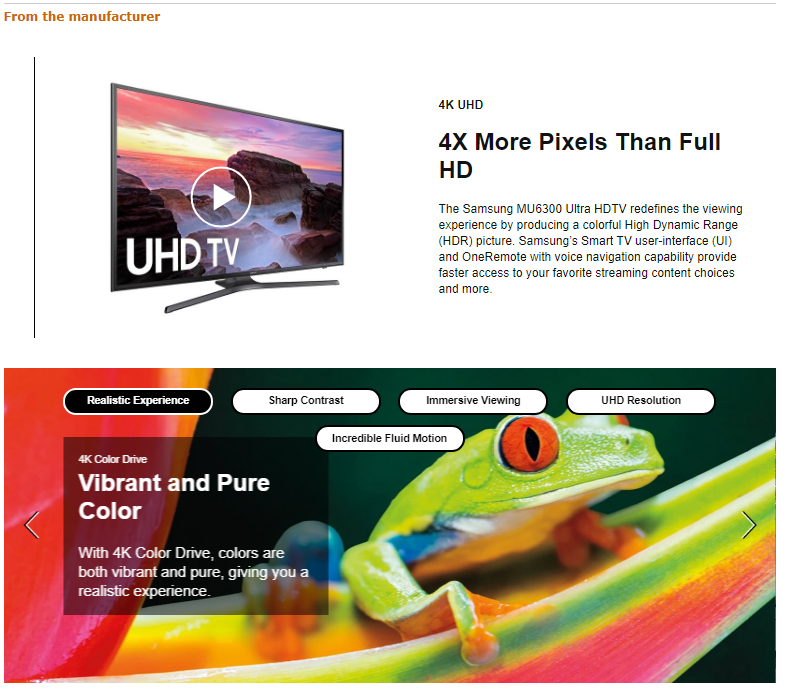 The use of Premium A+ content and the rich media it allows has given their product pages a premium and more on-brand feel, like an extension of their own website directly onto the Amazon page. Though Premium A+ is a good choice for some products, it may not be the best option for everyone. 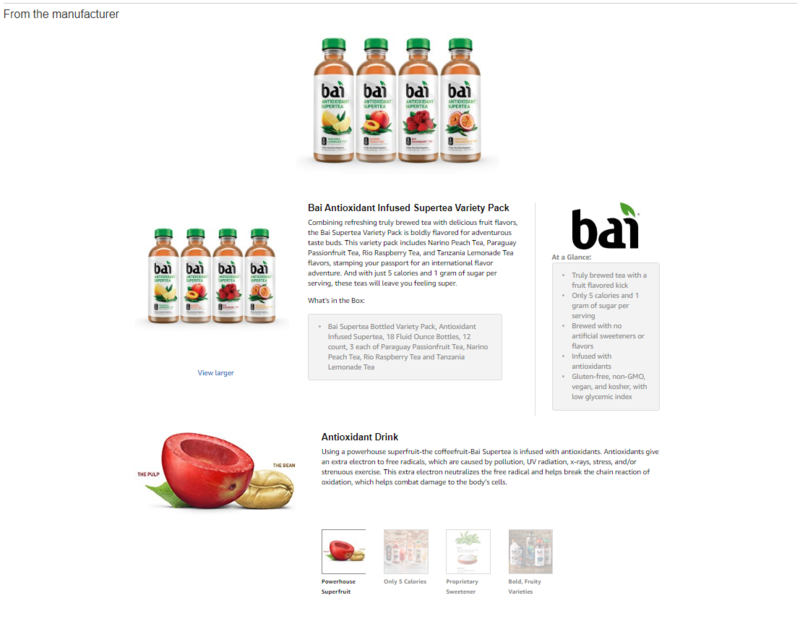 Up-and-coming beverage company Bai has created strong product pages using standard A+ modules and then focused on driving impressions and creating brand awareness with closely monitored Amazon Marketing Services (AMS) campaigns. By timing AMS campaign pushes with national TV advertising around the Super Bowl, Bai was able to raise their impressions to over 1.5 million in a single day. Bai also learned from the data generated by these advertising campaigns, allowing them to further optimize their content for a dramatic increase in Return On Ad Spend (ROAS). By creating a solid foundation of content and then optimizing it with information learned from AMS campaigns, Bai was able to create product page content that is simultaneously informative, strategic, and highly discoverable. Now that we've established the importance of content as the foundation of a positive customer experience, we can begin to break down product page content piece by piece. One of the most important parts of any product page is its essential content - including the product title, bulleted list of features and benefits, and single-paragraph description – and yet many brands don't optimize these areas. A clear and concise title lets customers know exactly what they're looking for, and should include the company's name, product name, and any important and distinguishing color, size, and pack information. Bulleted lists exist in the most important real estate on the product page, "above the fold," so customers see them instantly without scrolling. This section should highlight the top 5 features and benefits of the product while remaining scannable. The product description paragraph gives the brand space to go into more detail, and should include the most pertinent information about the product. Many brands attempt to load their product titles and bullets with keywords and phrases to drive page traffic. This approach is shortsighted, as it not only annoys customers who have to sort through unnecessary information to find what they're looking for, it also makes the product pages virtually unreadable by digital assistants like Alexa. The benefits of this practice do not outweigh the cons. First impressions are important, and both uninformative and overstuffed basic content will turn potential customers away. Once brands have optimized their essential content, they should move on to creating A+ content. This is the part of the product page that allows it to shine, with the ability to add enlargeable images and a variety of text styles to suit every type of reader and learner. Bolded headers and bulleted lists allow customers to scan for pertinent information, while full paragraphs let detail-oriented learners dig in to the product's finer points. Visual banners allow companies to create a branded space, while product comparison charts can help move customers in the right direction if this product wasn't quite what they were looking for. Premium A+ content expands on this model, offering greater visual opportunities like page-stretching imagery and integrated video, however these features come at the expense of larger sections of text. This is fine for products that rely on image and style for sales, like upscale headphones, but may not be ideal for products with lots of detailed features, like routers. The service is still too new for any concrete ROI data, so it's hard to say if the premium price tag is currently worth it. However, when Amazon added Premium A+ they dispatched the slotting fees for Basic A+, so brands no longer have an excuse for neglecting enhanced content. With no added costs, Basic A+ content should now be standard on every product page. 1. Audit Your Amazon Content – Understanding where your current content stands now is essential for moving forward. Are your pages full of outdated information? Does the messaging reflect current brand initiatives? 2. Optimize Your Basic Content – This content drives search and sets the tone with potential customers. First impressions are key, and A+ Content won't matter if shoppers can't find your products. 3. Audit Your Assets and Understand Your Customer Base – Do you have the high-resolution imagery and rich media required to take full advantage Premium A+ content? Are your customers looking for a cutting edge product page experience or do they just want to be informed? Figure out which type of enhanced content is best suited for your brand. 4. Understand the Costs – If you do decide to go with Premium A+, you'll have to negotiate with Amazon and your agency to access and optimize the Premium modules. When you do, remember the 80/20 rule: Invest first in the 20% of your products that result in 80% of your sales. Eventually, 100% of your products on Amazon should have some form of enhanced content.